Transformers TCG promo kits are rolling out to WPN stores for SIEGE I! 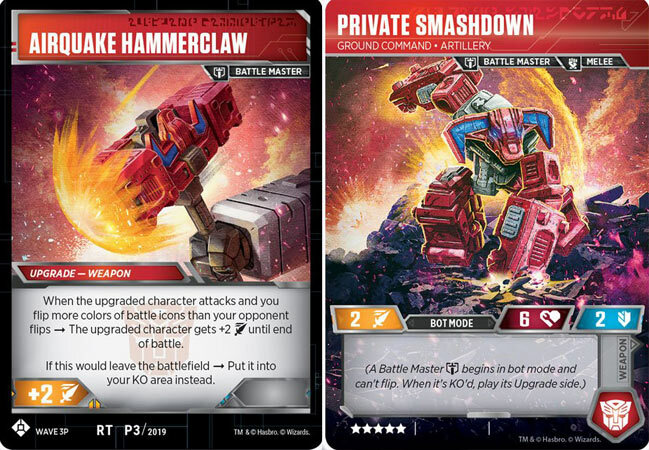 Here are the details on what’s in each kit, including how to get them, what to ask your retailer, and a look at PRIVATE SMASHDOWN, the launch day promo not available in booster packs! Click here to see the Wave 3 cards we’ve seen so far. Get in touch with your Friendly Local Game Store and ask them to sign up and order a kit soon! The next Transformers TCG set, War for Cybertron Siege I, is coming soon! Log into Wizards Event Reporter now* to get promotional materials from Wizards of the Coast, including versions of cards not available in booster packs, to help support it. When we surveyed participating retailers on a similar recent promotion, the number one piece of feedback we heard was that demos helped drive sales, and promo cards would help drive them even further. We heard you, and we put together a fantastic set of promos for War for Cybertron Siege I. 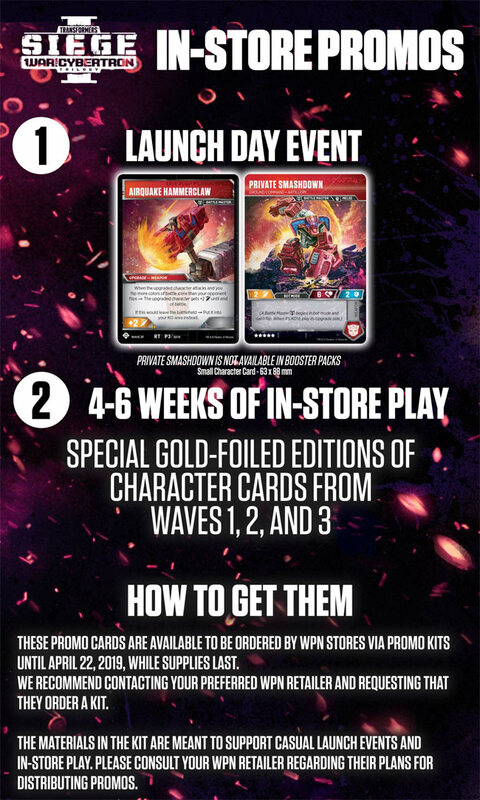 All this is to help you run a casual Launch Party event when War for Cybertron Siege I launches, plus support any Transformers TCG in-store play that you choose to host afterward. We can’t wait for you to check out the cards, which you’ll see after we ship them in late May. You can order these materials in Wizards Event Reporter until April 22 while supplies last. Log in and sign up now! *Transformers TCG War for Cybertron Siege I promotional materials will be available to order while supplies last for retailers in regions in which the Transformers TCG is made available. Canadian WPN members, minus Quebec, will receive the promo materials automatically. No sign up required.Please contact your local support team with any questions. Transformers: Rise of the Combiners Card Game Packs – On Sale Now! New Boosters for the Yu-Gi-Oh! TCG in May!